For an edge rusher-needy team, the 49ers are in luck. This year’s free agent class has options that should intrigue the 49ers, despite many of them already signing elsewhere. 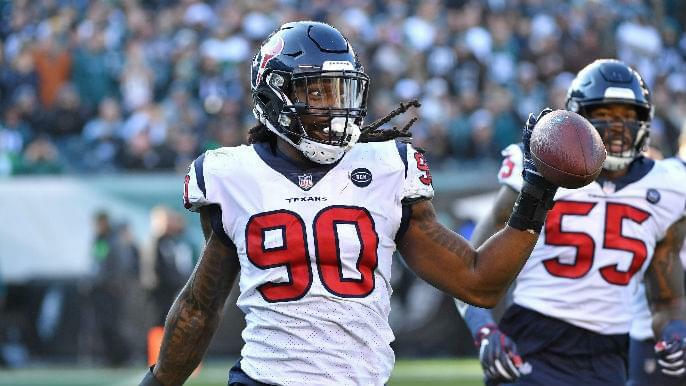 Four teams franchise-tagged their star edge rushers (Dallas’ DeMarcus Lawrence, Kansas City’s Dee Ford, Houston’s Jadeveon Clowney, and Seattle’s Frank Clark). Three notable edge rushers (Trey Flowers, Dante Fowler Jr., and Terrell Suggs) signed with teams Monday. The 49ers reportedly pursued Suggs, but the Arizona Cardinals won the bidding war. That move underscored San Francisco’s urgency to bolster its subpar pass rush. The 49ers had about $66 million in cap space entering Monday. They quickly made a splash after the legal tampering window opened, signing former Tampa Bay Buccaneers linebacker Kwon Alexander to a four-year, $54-million deal. Let’s break down the remaining free agent edge rushers. The Chiefs have applied their franchise tag to Ford, but they are open to trading him. They are shopping him for a second-round pick, and the 49ers have reportedly expressed their interest. They have the No. 36 overall pick in April’s draft. This past season, Ford played 16 games for the first time since his rookie year in 2014, and the production followed. Ford finished ninth in the NFL with 13 sacks, the most of his career. He led the league with seven forced fumbles. Houston just turned 30, but his production has been steady. He amassed nine and 9.5 sacks in the past two seasons. He could be the perfect complement to one of the standout EDGE prospects the 49ers seem destined to pick with the No. 2 overall pick. Ansah posted 14.5 sacks in 2015 and 12 more in 2017. But he has battled health issues throughout his six-year career, missing five games throughout the 2016 and 2017 seasons. In 2018, he started just two games due to a shoulder injury that ultimately sent him to injured reserve in mid-December. Ansah is one of the most proven players on this list, but he’s an expensive investment for someone who hasn’t played a full season in four years. Smith is a steady, active edge rusher with 24.5 sacks over his four-year career. He has never missed an NFL game. Smith is a better, more tenacious edge rusher than anyone on the current 49ers’ roster. His 25 quarterback hits are the second-most of any player on this list. Barrett’s lack of production may reflect lack of opportunity more than anything else. Stuck behind Von Miller, Bradley Chubb, and Shane Ray throughout his four years in Denver, Barrett will get to show what he can do with a greater workload elsewhere. He could be an inexpensive, low-risk addition. Ray and Barrett find themselves in similar situations despite their juxtaposing draft experiences. Ray was a first-rounder. Barrett went undrafted. Yet Ray struggled to take off, tallying just 14 sacks in four seasons, eight of which came in 2016. He has battled a wrist injury throughout the past two years. Golden’s production has regressed over the past two years due to knee injuries. He posted 12.5 sacks in 2016, but he has combined for just 2.5 over the past two seasons. Golden, ideally, would be a complementary piece alongside a more marquee free agent signing or top draft pick for the 49ers. Matthews, 32, has four seasons of 10-plus sacks, but he hasn’t accomplished that feat throughout the past four seasons. But he still has solid years left. The six-time Pro Bowler could slot in at strong-side linebacker in San Francisco’s defense.